Naples Beach Florida lies within Olde Naples, where the original mansions along “Millionaires’ Row” provide a unique backdrop to this beautiful beach. In retrospect, the beach provides a unique backdrop to the residents of those mansions as well. A walk on Naples Beach in the morning. Naples Beach Florida lies within Olde Naples, where the original mansions along “Millionaires’ Row” provide a unique backdrop to this beautiful beach. In retrospect, the beach provides a unique backdrop to the residents of those mansions as well. “Millionaire’s Row” was built in 1886 when a group of Kentuckians and Ohioans bought 8,700 acres of gorgeous beach and began building beautiful homes and hotels on it. Many of these structures still stand and are a nice change from the usual high-rise hotels and country clubs that occupy most beaches today. One of the landmarks of Naples Beach Florida is the Naples Fishing Pier and is one of the most popular beach spots around. This pier was first built in 1888 and has seen its share of hurricanes. It appears formidable but no match for a hurricane. Fortunately, the good people of Naples always bring it back to its former glory. Enjoy some of the best shopping in the country around 5th Avenue, 3rd Street South, or just stroll into some of the local beach shops in this tropical paradise. Don't forget those souvenirs, promised and expected back home. There are many deals to be had and many classy shops so you can find something for everyone, including yourself. Spend an afternoon looking at manatees, dolphins, alligators and other local ocean life aboard Double R’s Manatee Tours. The Naples Museum of Art is worth a visit. Whether you enjoy art or not, it’s still incredible to behold the amazing works of art housed here. There are several great golf clubs to choose from. A few to try: Naples Beach Hotel & Golf Club, Lely Flamingo Island Club, Eagles Lake Golf Club and Tiburon Golf Club. Kids of most ages: The entire family will love the boat rides, petting zoos and fun animal shows at Jungle Larry’s Zoological Park . Enjoy the kids' creative imaginations as they explore the Children’s Museum of Naples that features educational and fun exhibits for the little ones and adults to enjoy as well. Eating: A visit to Naples would not be complete without experiencing the exquisite Italian cuisine offered at Little Italy. Alice Sweetwaters offers fresh and delicious seafood and many other types of cuisine with a charming wait staff and reasonable prices. Sleeping: The Inn of Naples has been referred to by visitors as the “best kept secret” in Naples. A central location and affordable rates make this a great choice for a comfortable stay. Or, spend some nights at the Edgewater Beach Hotel and Club and you won’t want to leave this tropical paradise. It’s located right on the beach and offers some breathtaking ocean views. 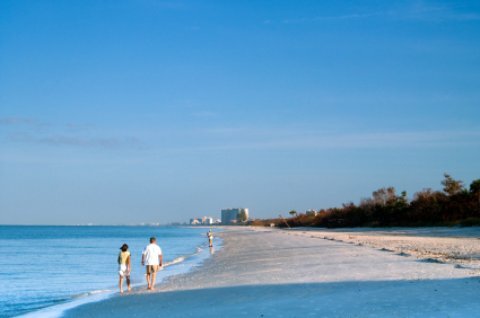 Naples Beach Florida is sophisticated and you will enjoy all it has to offer. Come on down!